The government faces mounting pressure to help those hit by high energy bills, with TUC leader Brendan Barber the latest to call for a windfall tax. Mr Barber warned Gordon Brown that further inaction would mean Labour paying the price at the next election. Millions of households were already in recession, he said, renewing calls for a one-off tax on power firms' profits. This week the government ruled out one-off fuel payments to help those hit hardest by rising energy prices. A statement on energy prices is expected next week, but it is thought a windfall tax will not be among the measures announced. Ministers were hoping to unveil a package of help with fuel bills, including payments of between £50 and £100 per head. But after energy firms refused to help provide the cash, the focus is now being put on improving energy efficiency, rather than securing immediate savings. The government has denied "caving in" to the energy companies over cash rebates. Environment secretary Hilary Benn said on Friday that talks were continuing over what "further contribution" energy companies could make. But pressure remains on the government to act decisively. At next week's TUC congress, Mr Barber is set to demand an end to the "yawning chasm" between rich and poor. He joins a growing chorus of Labour supporters who have condemned the government for failing poorer families. 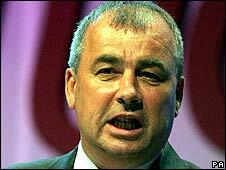 On Friday Tony Woodley of Unite branded the decision to ditch plans for help with fuel bills as a "downright disgrace". And on Saturday the Green Party called for a windfall tax on energy company profits. However, despite additional pressure from more than 120 Labour MPs who are believed to have backed calls for a windfall tax, most observers believe that the Treasury will stand firm. One reason is thought to be the fear that any windfall tax imposed by the government will merely be passed onto consumers by energy firms in the form of higher bills. BBC political correspondent Norman Smith said that the growing pressure from MPs, combined with Gordon Brown's vulnerable position, made it difficult for the Prime Minister to dismiss the idea completely - resulting in mixed messages. "If you want to get energy companies to cough up, somehow you've got to get some sort of leverage and the windfall tax is a way to do it," our correspondent said. "Instinctively and intellectually the chancellor, the prime minister and the business secretary are deeply sceptical about a windfall tax, but how else do you get pressure on the energy companies? "You can appeal to their better nature but these are commercial global companies. "They don't have to invest in Britain, so if you want to get leverage a windfall tax could be a good way to do it." One Labour MP who supports the windfall tax, Lindsay Hoyle, told the BBC it was "not right" that people had real concerns for putting the heating on because of worries about their power bills. He said that the energy watchdog Ofgem was a "toothless tiger" in controlling prices and that energy firms were making "immoral earnings". "We've got to put a windfall tax in, we've got to get those prices down. We've got to use a stick against these greedy energy companies," he said. The row over windfall taxes illustrates the growing dissatisfaction within the labour movement over the government's priorities. Speaking ahead of the TUC conference in Brighton, Mr Barber also asked for the tax system to be reformed to help "ordinary people". He also warned that there could be further industrial action before the end of the year over public sector pay rises - which were set at a below-inflation rate last year. In his opening address on Monday, Mr Barber will blame "greedy" bankers and higher world demand for oil for the credit crunch and will accuse governments of listening too much to big business. He will say: "It's not fair that employees are facing a fall in their living standards while top bosses see their pay packets go up by 20% or even 30%. Calls for co-ordinated action are expected during the conference, led by civil servants' and teachers' unions. With Gordon Brown's leadership coming under increasing criticism ahead of Labour's annual conference later this month, his deputy, Harriet Harman, has admitted that the government is suffering badly from the changing economic times. "When people feel that their lives are more of a struggle than they used to be, then that expresses itself in dissatisfaction with the Government," she told The Times. "The main reason why we are low in the polls is because people are facing difficult circumstances."